Property Location Located in Oconomowoc, Pleasant Street Bed and Breakfast is minutes from Theatre On Main and close to Fowler Lake Park. 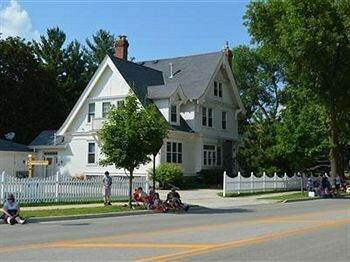 This 4-star bed & breakfast is within close proximity of Oconomowoc Masonic Center and Oconomowoc Historical Museum.Rooms Make yourself at home in one of the 2 guestrooms featuring refrigerators and flat-screen televisions. Your room comes with a pillowtop bed. Cable programming and iPads are provided for your entertainment, while complimentary wireless Internet access keeps you connected. Private bathrooms have complimentary toiletries and hair dryers.Rec, Spa, Premium Amenities Make use of convenient amenities such as complimentary wireless Internet access, a fireplace in the lobby, and tour/ticket assistance.Dining Mingle with other guests at a complimentary reception, held daily. A complimentary full breakfast is served daily.Business, Other Amenities Featured amenities include dry cleaning/laundry services and coffee/tea in the lobby.